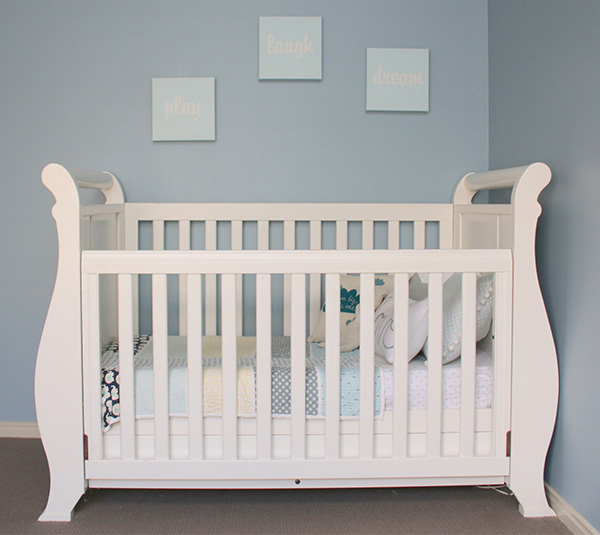 Show us your nursery - calm and serene for a little boy blue, it's Lincoln's room! 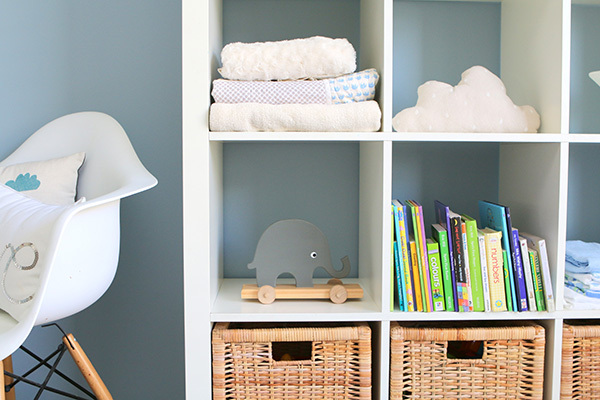 Show us your nursery – calm and serene for a little boy blue, it’s Lincoln’s room! 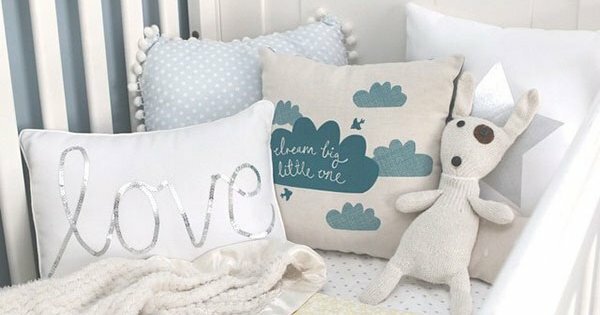 It’s the traditional colour for boys, but blue is not so big these days when it comes to decorating the nursery. 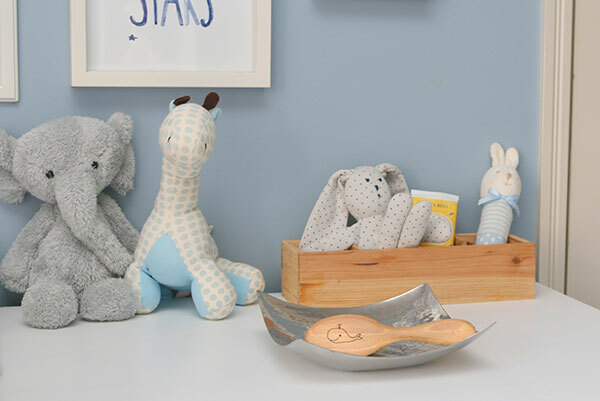 And that’s a shame, because here’s a nursery that proves blue nurseries for boys can be anything but boring. 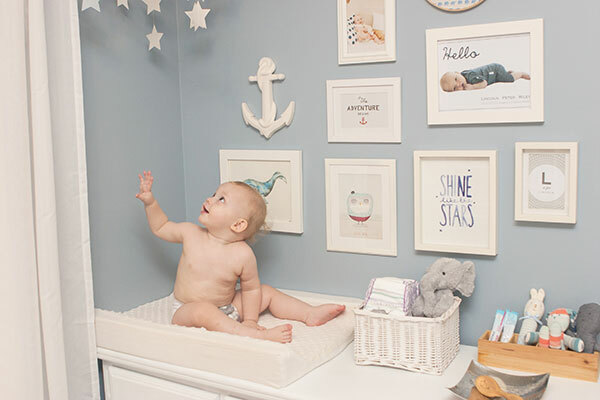 Mum Tamsyn completely embraced the challenge of turning a blue space into a sweet boyish nursery for her second baby, Lincoln, to call his own. Tamsyn writes: Link’s room is my favourite place in our house, it’s so serene and calm. 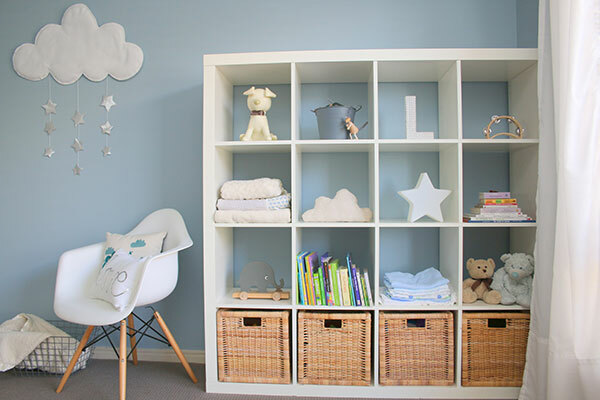 I’ve always been drawn to the colour blue, so when I had boys I knew exactly what I was going to do in their nurseries! The room had already been painted blue from when it was our first little guy’s nursery and my husband was not keen on repainting. My challenge was to use the same colour walls (and a lot of the same furniture) yet still come up with a nursery that looked completely different from the last. I’m so happy that I was able to achieve that! The Boori Sleigh Cot is a much loved hand-me-down from my beautiful sister. Max (our oldest) used it when he was a baby, Lincoln is in it now and it will eventually be our newborn’s when he is ready to move out of his bassinet. The cot is made up with a stunning quilt made by my very clever mum, a ‘love’ and star cushion from my shop, a gorgeous Robin and Mould cloud cushion, a DIY pom pom trim cushion and Lincoln’s much loved blanket (that he has called nee-nee for as long as he has been able to talk!). 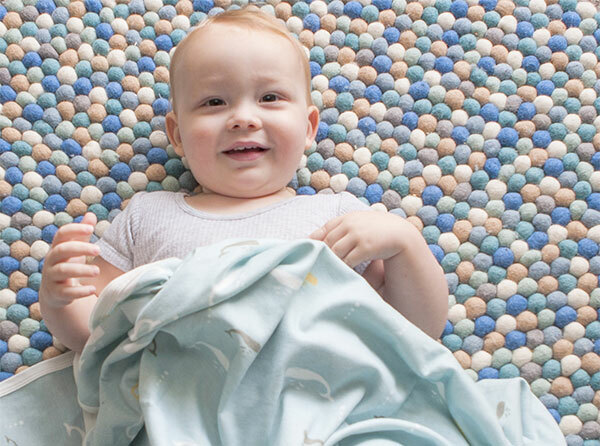 The felt ball rug is a custom order from Etsy. I love that you can choose any colour combination you like and have it made up into a gorgeous statement piece. The whale blanket that Link has is another favourite of mine from Goo Collection and is so perfect in this room. The Ikea Expedit is another hand-me-down, I originally had it in here when this was Max’s room and it stayed when Link moved in. It’s filled with so many things that he loves! Link has also really fallen in love with books lately and is always pulling books out and bringing them to us to read. Most days we end up sitting on the felt ball rug and reading together. The baskets down the bottom hold most of his toys, they’re sorted by type so that we can find things easily. One for blocks, another for cars, planes etcetera, another for noisy toys and the last basket holds cuddly toys. The cloud mobile was a DIY project I made as the room was coming together and I absolutely love how it turned out. The mobile above the table was a DIY I did years ago (again it was originally for Max’s room), once we had ceiling fans installed I moved it from the centre of the room to its current location. Lincoln adores it and loves to sing twinkle twinkle with us as we change him. The change table is a dresser I picked up second hand from an op shop, it was originally dark brown but I knew it would be perfect as soon as I saw it. I primed it, painted it with about a million coats of paint and switched out the brass drawer pulls for silver ones. Finishing touches haven’t been forgotten either with Tamsyn showcasing some of her favourite prints for Lincoln to admire. 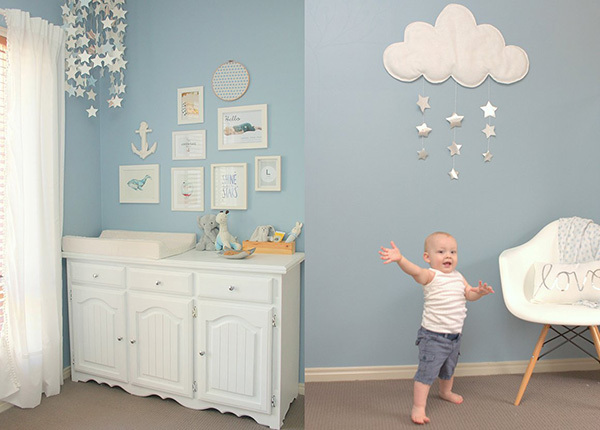 Tamsyn, we think you’re an absolute star and clearly have a talent for both design and DIY! We just know that Lincoln is going to love spending many, many hours discovering all that his bedroom holds as he grows.